I have terrible Costume A-D-D right now. I want to make ALL the 18th century things! It's good to be inspired, though! I have a trip to Colonial Williamsburg coming up in early June, so of course I'm sewing like mad to make new things. I do feel a touch guilty - my old gowns are fine, so why make so many new things? ... but I've given up trying to justify this hobby a long time ago. So, to the new things! 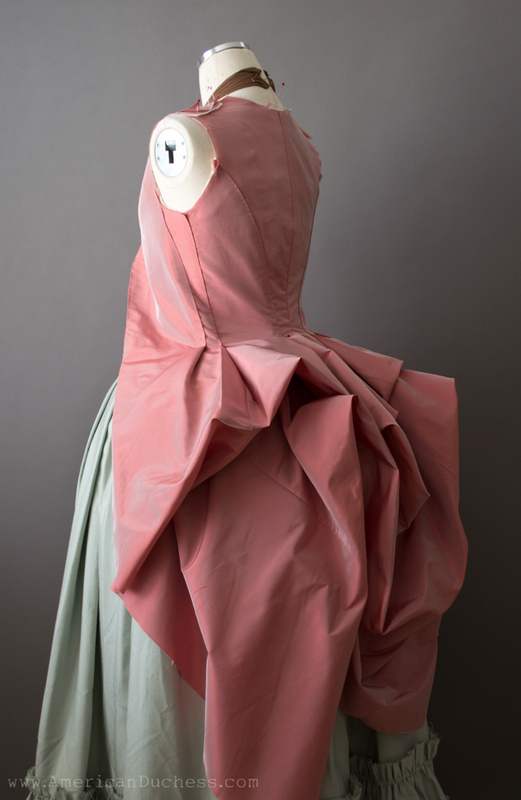 Last weekend, after finishing the 1940s blouse, I was feeling confident, so I sliced into some pink shot taffeta, determined to turn it into a polonaise. The Robe a la Polonaise has thus far eluded me. I tried to make a Polonaise jacket once, but it failed, and since then I've sortof just ignored the Polonaise Elephant in the room. The Polonaise confuses me, though. I get that the pieces are cut all-in-one with the skirt, like a man's frock coat, and I get the back construction and fitting, but the hangy-openy bits at the front confuse me. I want to make everything fit like a glove, but having to leave those pieces hanging free and with the weird little foldy-backy thing they do....it makes me a little crazy, and I have a hard time believing it will all work out in the end. Either way, this thing is going, and it's going surprisingly well. I have the bodice together, but plan to revisit the center back seam and probably the side back seams as well. The remaining bits will be an exercise in piecing. I didn't have nearly enough pink taff for the whole thing, but I want the petticoat to match the gown, so I found some matching pink cotton to use at the back where the poofy polonaise bits will cover the petticoat, and under the very deep pleated organza hem trim. The cotton will also underlay the organza sabot cuff trim on the sleeves, so I will use as little remaining taffeta in these applications as possible. I still have a waistcoat front to get out of the scraps, too. Eep! I love the color, though, and I'm pleased with the construction so far. It will be so much fun to wear in June! I´m excited about the result! And I love this sweet bonbon colour!!! Hooray for pink! It definitely appears to be the costumer color of the year! At the Francaise Dinner this past weekend we had three pink gowns, and would have had a fourth if another lady hadn't changed her mind about what she was going to wear! XD I can't wait to see how this turns out! It looks SO fabulous already! I feel the same way about the hanging front parts as you do. In fact, they scare me so much that the only reason why I haven't been able to start making my robe à la polonaise yet is that I, too, have attempted to make a polonaise jacket and the front of it ended up being an ugly, unflattering mess... So I've been too afraid of wasting my gorgeous pale blue silk taffeta fabric on failing to get the front to look right. We'll see how it turns out. I feel like I've already done some things wrong - I'll probably pick out the side back or side seams and re-fit them. I thought I could do it all in the center back seam, but not so. Ugh, here's hoping! I love the style, but I can see how this could be a hot mess if not done just right. Drapery weights are a good idea. I may need them - we'll see! It's really nice (love the colors combo). I'm also in costume ADD , espacially for accessoiries (I want to sew mittens, stockings, cap, etc etc). Gosh, you've just reminded me I also need to sew mittens, stockings, caps, aprons, etc., to go with all these new gowns. To the sewing room, Batman! 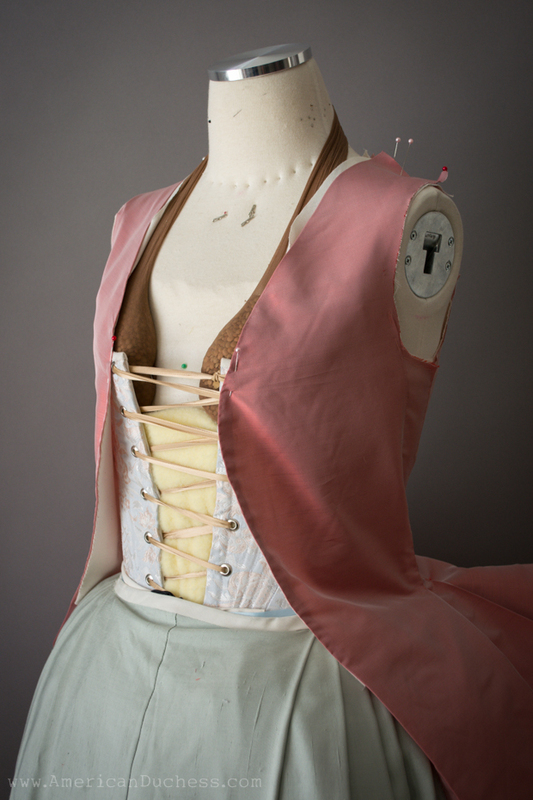 Hahah I have two pink gowns in progress but both Victorian.... Looking lovely. I'm thinking you kind of have to attach the foldy-backy-parts to a lower layer at the waist. Pin them, use hooks and eyes or snaps or add some kind of a stay tape that goes under the waistcoat front. I don't think it's possible to have the fabric cling to your waist there unless it's somehow attached: the hem will pull at it no matter how heavy or light it is and the fabric will find the shortest way from the bust towards the hips, which unfortunately doesn't include a curve towards the waist. I'm not usually a fan of pinks, but you've found an elegant shade :). p.s. I love that color, it's like strawberry sherbet! Great name, where will you introduce the baby blue for the third Powerpuff Girl? And the hanging bits in front are also what I don't like about the Polonaise style. They just seem weirdly unfitting there, right? I'm so psyched that you (and Sanna) are sewing a legit polonaise, because I've read so much about them that I really want to see them made! And this one looks like it's going to be fantastic. Unfortunately, I think the fronts might be supposed to just hang there awkwardly. The earlier writers enthused about how that made it flattering for larger waistlines (what). Maybe they wouldn't flip back so much if you let out a bit of the front-most pleat, though? Yes, I think you're right. Some images show the flappy fronts quite open and flappy. Others show them more trim. 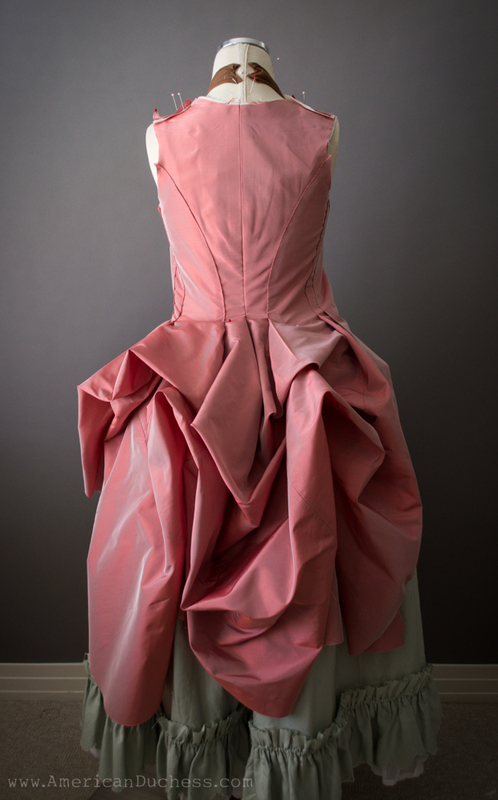 It's all in the fitting that goes through the weird pleats. I'm sure I've not done this right, but I've never had the change to examines the construction on an original, so I'm just doing the best I can.